Millions of people all around the world are celebrating the Chinese New Year. The special event is also known as the Lunar New Year which begins on the second new moon at the start of the year and ends on a full moon fifteen days later. The event is marked all over the world in lots of different ways. People visit their families and friends, have special meals and a lot of fireworks go off because it's thought that the noise and lights will ward off evil spirits for the year ahead. 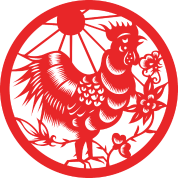 The new year is always named after one of twelve animals and 2017 is the year of the Rooster.